I’ve been silent… but busy. Lurking in the shadows covered in paint splatters, brushes akimbo, making messes all over the house. I’ve been amusing myself greatly steadily churning out one painting after another and keeping them all to myself (mostly). I’ve been working on a single body of work for over a year now and that is an astronomically long time for me. (I guess I needn’t worry about ADD). I have not yet found a place to display all this grandiose weirdness, but then I haven’t really looked either . Call it eternal optimism or blind faith but I can’t imagine I wouldn’t find one when the time comes. They’re awful pretty after all. Until the day I’m ready to share all of what I’m doing I’ll be sharing what I love about what I do and what I love that others are doing. (with an occasional sneak peek). 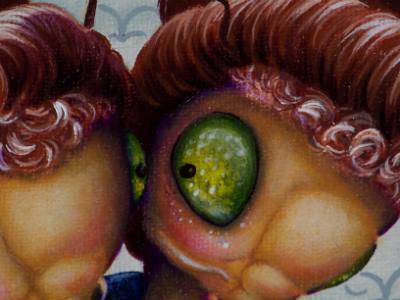 This entry was posted in Victorian mantis project and tagged Acrylic paint, art, Mantis, paint. Bookmark the permalink.